Page added in November 2018. Photos taken with Canon Powershot SX 700 HS in May 2016. That part of the Gallias which is washed by the inland (Mediterranean) sea is called the province of Gallia Narbonensis. (..) It is divided from Italy by the river Varus, and by the range of the Alps, the great safeguards of the Roman Empire. From the remainder of Gaul, on the north, it is separated by the mountains Cebenna and Jura. In the cultivation of the soil, the manners and civilization of the inhabitants, and the extent of its wealth, it is surpassed by none of the provinces, and, in short, might be more truthfully described as a part of Italy than as a province. Pliny the Elder - Historia Naturalis - Translation by John Bostock and Henry Thomas Riley. Pliny was the governor of Gallia Narbonensis in 70 AD. 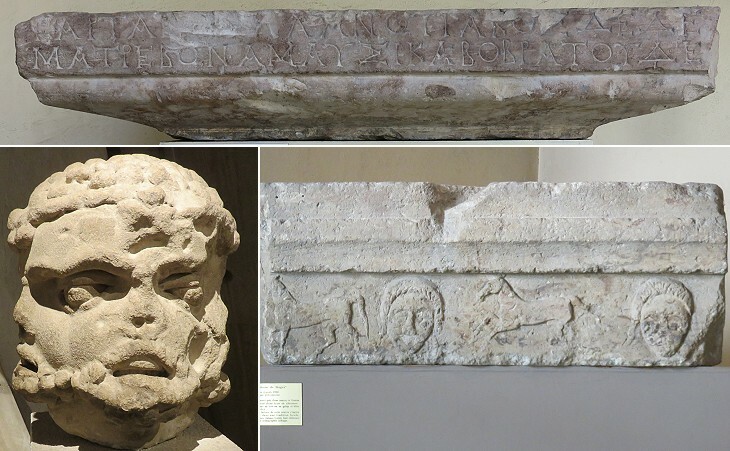 In no province of the Roman Empire was Latin culture more firmly rooted, and in none did it show more Roman vigorous growth than in Gaul, especially in the south. (..) The native language had given place to that of Italy, and the Latin of Bordeaux was said to have been the purest in Gaul. 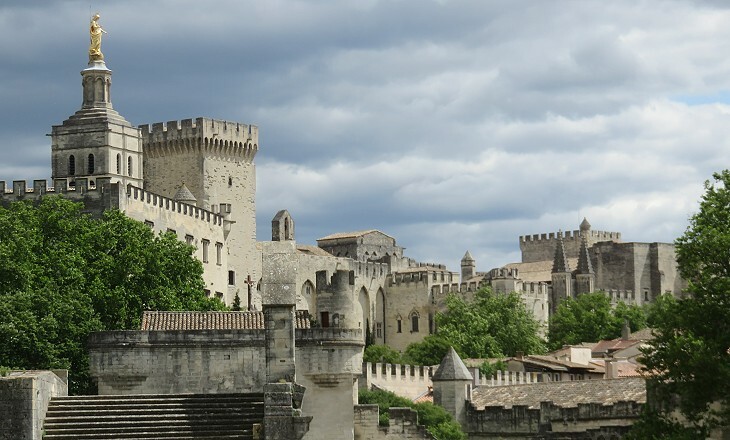 Provence is still full of splendid remains of Roman architecture, and Italy itself cannot show anything superior to the temples at Nimes and Vienne, the amphitheatres at Nimes and Arles, the great theatre at Orange, and the stupendous aqueduct of the Pont du Gard which dwarfs those of the Campagna. At the end of the Third Punic War in 149 BC the Romans ruled most of the Iberian peninsula, but they had not conquered the territories along the Mediterranean Sea between Italy and Spain. In a series of military expeditions in the 120s, they subjugated some of the local tribes and, with the acceptance of other tribes and the support of Massilia, a Greek town and a longtime ally of Rome, they were able to gain control of the coastal region of Southern France which was called Gallia Transalpina or Ulterior to distinguish it from Gallia Cisalpina or Citerior, i.e. northern Italy. In 118 BC they founded Narbo Martius, a Roman colony along Via Domitia, a military road from Italy to Spain which crossed the Alps. 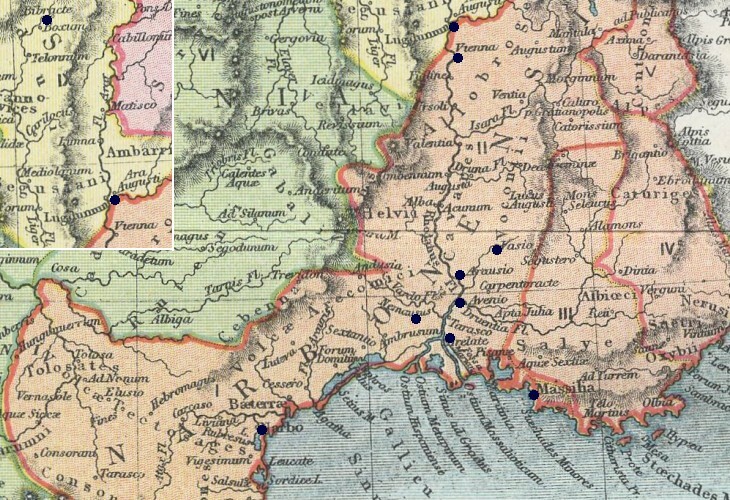 Eventually the province became known as Gallia Narbonensis and another road (Via Aurelia) linked it with Italy along the coast. The bulk of trade with Rome was carried out by sea and a shipping company of Narbonne had a permanent statio (agency) at Ostia. Nor do I pass you over, O Marseille, (..) a city, the strict discipline and wisdom of which I do not know whether I might not say was superior, not only to that of Greece, but to that of any nation whatever; a city which, though so far separated from the districts of all the Greeks, and from their fashions and language, and though placed in the extremity of the world and surrounded by tribes of Gauls, and washed with the waves of barbarism, is so regulated and governed by the counsels of its chief men, that there is no nation which does not find it easier to praise its institutions than to imitate them. Marseille was founded in ca 600 BC by Greek colonists from Phocaea. It had an enormous influence on the development of the region by persuading the local tribes to turn to agriculture and to adopt advanced techniques, especially in the production of olive oil. In almost all matters, in their public and private transactions, they use Greek characters. Julius Caesar - The Gallic Wars - Translation by W. A. McDevitte and W. S. Bohn. Marseille had an influence also on the cultural and artistic development of the region. 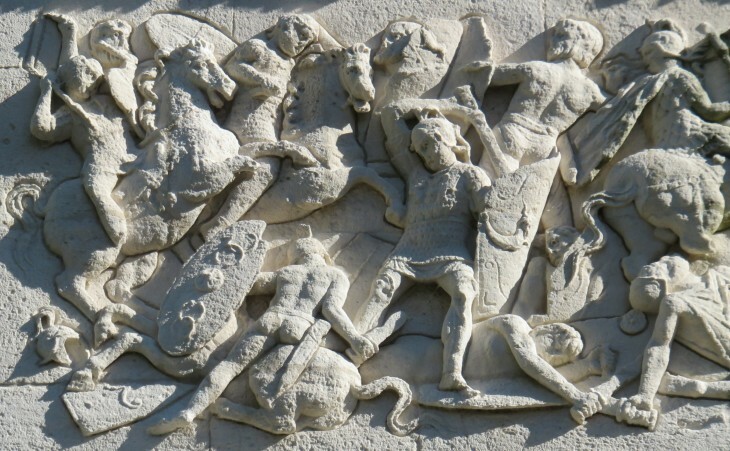 The local Celtic tribes adopted the Greek alphabet and they were influenced by statues and reliefs of Greek origin. When the Romans gained control of the region they did not impose their direct rule on all of it. They established a series of alliances and granted privileges to some tribes in order to avoid coalitions against their rule. Traditional elements of the Celtic culture, from religion to metalworking, were integrated with those brought by the Roman settlers. Keltoi is a Greek word by which the inhabitants of Marseille called the tribes living around their town. Galli is the term used by the Romans for the people living in Northern Italy and France. Today's use of Celtic is a generic reference to the pre-Romans inhabitants of many parts of Europe and to their language and culture. In 58 BC Julius Caesar, Proconsul of Gallia Narbonensis, began a series of campaigns which led to the conquest of vast territories between the Atlantic Ocean and the River Rhine. In 51 he punished the tribes who had joined a rebellion promoted by Vercingetorix, the chief of the Arverni, but he granted privileges to those who had supported the Romans or had defected from the coalition. 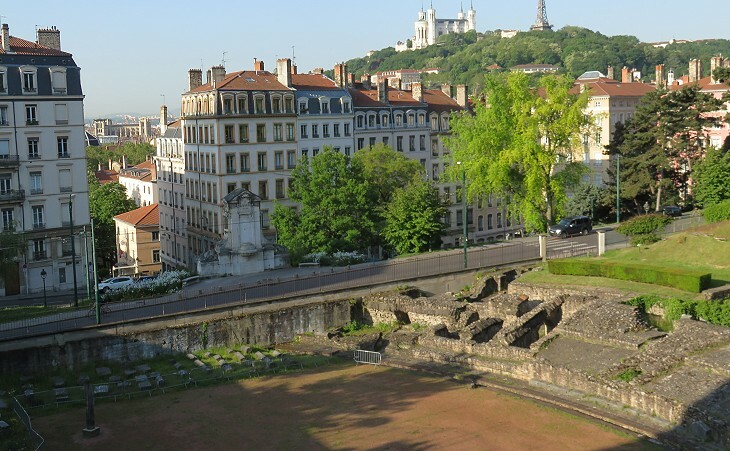 In 43 BC Lucius Munatius Plancus, one of Caesar's military commanders, founded Lugdunum (Lyon), a Roman colony at the confluence of the Rhône and Saône rivers, a key location from a military standpoint. Every year the representatives of the tribes of the new territories gathered at Lyon for a series of ceremonies in which they professed their loyalty to Rome and its emperors. These meetings were also meant to strengthen the authority of the tribe leaders and to recognize they had some degree of self-government. The valley of the River Saône ended very near that of the River Rhine; its control by the Romans led to the development of a new important trade route having a south-north direction from the Mediterranean Sea to Northern France, Germany and Britain. A number of towns were founded to promote trade; Augustodunum in the Saône valley, in the historical region of Burgundy, was named after Emperor Augustus and it served as the capital of the Aedui, a local tribe. The suffix dunum is a Gallic word for "fortified town". The upper left part of Saint-André Gate is a creation by Eugène Emmanuel Viollet-le-Duc (1814-1879), an architect who pioneered the restoration of historical buildings in France, but who is criticized today for having exceeded in reconstructing them (see the gate in an 1820s engraving). Do not let us talk then of restoration. The thing is a Lie from beginning to end. You may make a model of a building as you may of a corpse, and your model may have the shell of the old walls within it as your cast might have the skeleton, with what advantage I neither see nor care: but the old building is destroyed, and that more totally and mercilessly than if it had sunk into a heap of dust, or melted into a mass of clay. (..) But, it is said, there may come a necessity for restoration! Granted. Look the necessity full in the face, and understand it on its own terms. It is a necessity for destruction. Accept it as such, pull the building down, throw its stones into neglected corners, make ballast of them, or mortar, if you will; but do it honestly, and do not set up a Lie in their place. And look that necessity in the face before it comes, and you may prevent it. The principle of modern times (..) is to neglect buildings first, and restore them afterwards. Take proper care of your monuments, and you will not need to restore them. 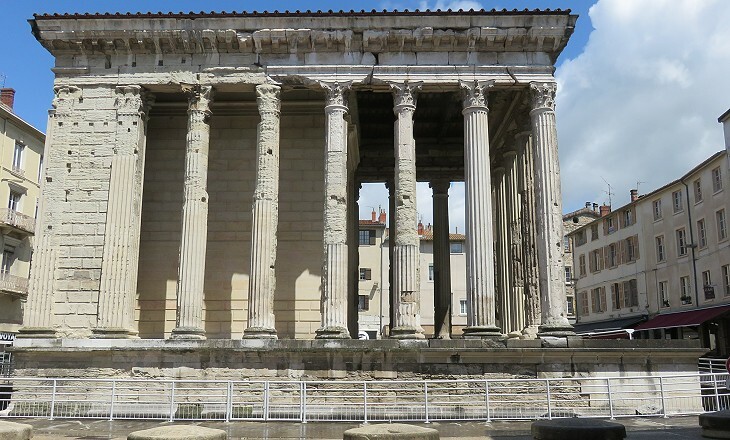 Some of the Roman monuments of France we see today can be regarded as being in part a lie, because of the way they were restored which deprived them of their antique and venerable decay. Descending thro' some very narrow streets, you see a chapel called Our Lady of Life, which is said to have been the Praetorium of Pilate, governor of this town. Over the door there is a stone-ball with this inscription, Hoc est pomum sceptri Pilati. After the conquests by Caesar the Romans took steps to improve communication between Italy and the Rhône valley and a road across the Little Saint Bernard Pass was opened to link Aosta in Italy with Vienne, a Roman colony which was founded in 47 BC. It retains many monuments of its Roman past which have been brought back to their assumed original aspect. According to a local tradition Pontius Pilate lived and died at Vienne. Initially winemaking was restricted to the coastal parts of Gallia Narbonensis, but eventually it was introduced in the Rhône, Saône and Rhine valleys. The Romans dug canals and built embankments for towing to favour inland navigation. Many inscriptions mention the existence in the region of a guild of utriculari, traders of commodities carried in wineskins. In 9 BC the expansion of the Romans in Germany came to an halt when three legions were massacred in the forest of Teutoburg. Augustus gave up new attempts to conquer territories beyond the Rhine, but Germanicus, a member of the Julio-Claudian family and the husband of a granddaughter of Augustus led a series of victorious military campaigns in Germany in 14-16 AD. His victories ensured that the German tribes could not invade Gaul. Eventually a complex system of fortifications was built by the Romans along the Rhine and the Danube thus granting security to Gaul for more than two centuries. Nemausus (Nîmes) is the metropolis of the Arecomisci; though far inferior to Narbonne both as to its commerce, and the number of foreigners attracted thither, it surpasses that city in the number of its citizens; for it has under its dominion four and twenty different villages all well inhabited, and by the same people, who pay tribute; it likewise enjoys the rights of the Latin towns, so that in Nemausus you meet with Roman citizens who have obtained the honours of the aedile and quaestorship. 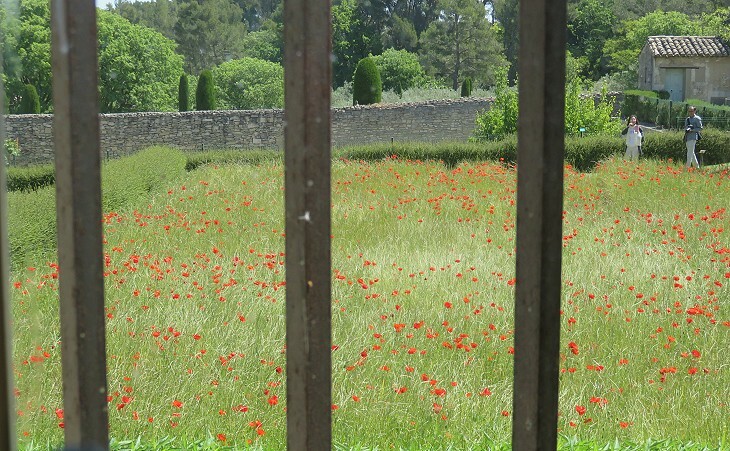 The security granted by the fortifications along the Rhine and the Danube ensured a long period of peace during which the towns of Southern France experienced a major economic development. They were no longer only suppliers of basic commodities to Rome, but their workshops manufactured vessels, tableware, jewels and other luxury items which were sold in the northern part of the country, in Britain and even to the German tribes outside the borders of the Empire. The richest towns, e.g. 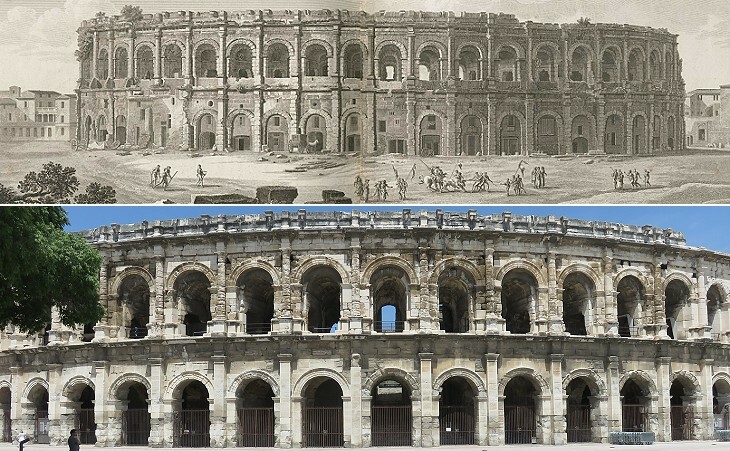 Nîmes, from which the family of Emperor Antoninus Pius originated, were embellished with facilities for mass entertainments. While I contemplated this stupendous pile, stretching sublimely from rock to rock across the valley, and the broad stream of the Gardon rolling with ease through its wide arches, I felt my mind strongly impressed with veneration for those extraordinary men, who had the spirit to plan, and the force to rear such colossal monuments of their art. Henry Swinburne - Travels through Spain in the Years 1775 and 1776 to which is added a Journey from Bayonne to Marseille. 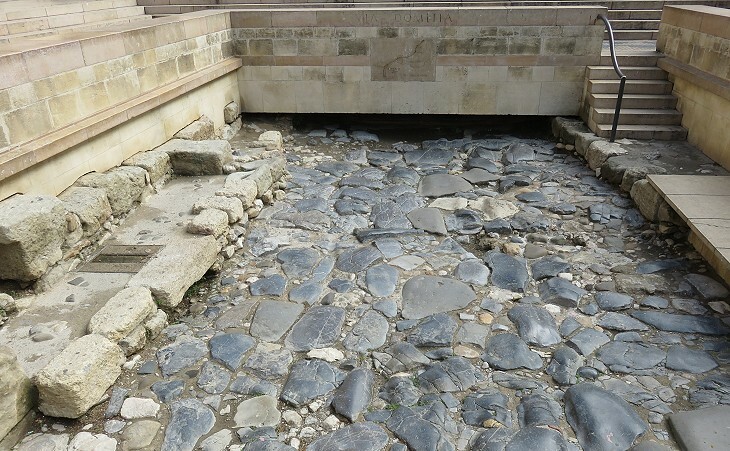 The Romans developed an advanced expertise in hydraulic engineering. 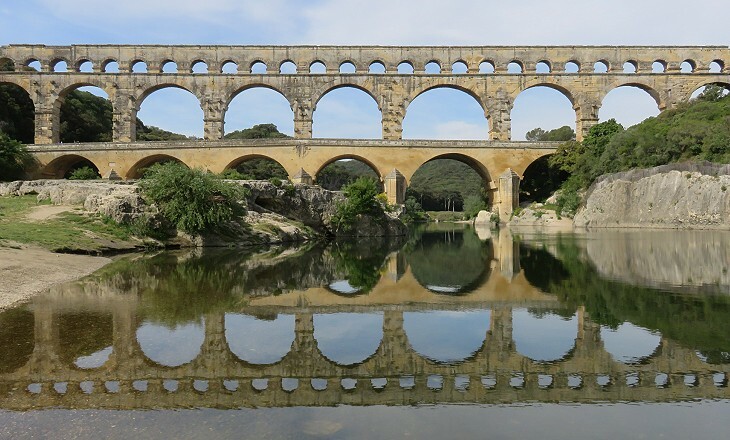 Classical landmark structures included aqueducts, dam reservoirs and irrigation and drainage networks. The design of the aqueducts implied a solid expertise in open channel hydraulics and pipe flows. The successful operation and maintenance of these outstanding water systems represented some massive achievements by ancient and modern standards. You may wish to see other imposing Roman aqueducts at Segovia and Merida in Spain, in Tunisia and in Rome. The climate of Gallia Narbonensis is characterized by mistral, a strong north-westerly cold wind which blows across the Rhône valley into the Mediterranean Sea. Notwithstanding a lower average temperature than that in Rome, the layout of the houses of the upper classes reflected traditional Roman patterns and was based on a central open courtyard. 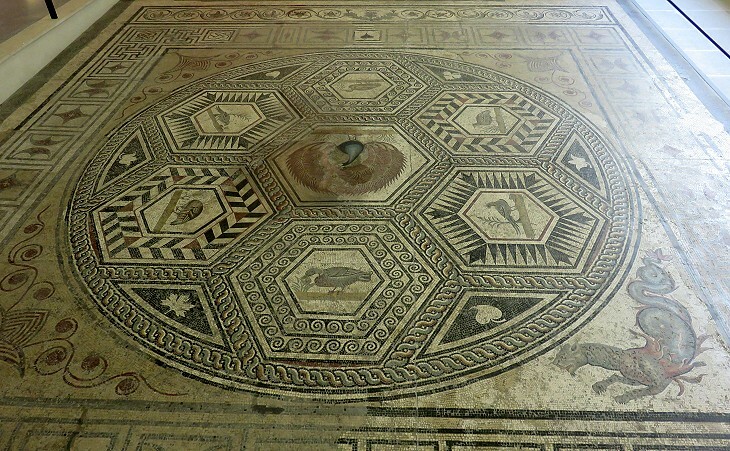 The techniques for laying durable floor mosaics were introduced by craftsmen from Italy, but eventually local workshops were able to satisfy the requests of the most demanding customers. Their works can be compared with those found in Tunisia and in the Levant, regions which are generally considered to have housed the best mosaic maker teams of the Roman Empire. The first Christians of Gaul came from the eastern regions of the Empire and the presence of the new religion was limited to the main towns near the coast and in the Rhône valley; the first martyrs are recorded in 177 at Lyon; according to a late VIth century account by St. Gregory of Tours, in ca 250 the Pope sent seven bishops to Gaul to evangelize the country. 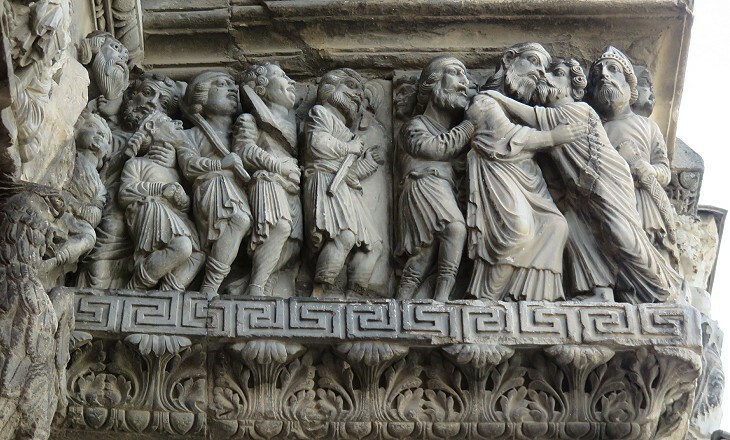 As a matter of fact at the time of the Edict of Tolerance issued by Emperor Constantine in 311 by which Christians were granted permission to openly practice their religion, the new faith had not many followers, especially in northern Gaul. 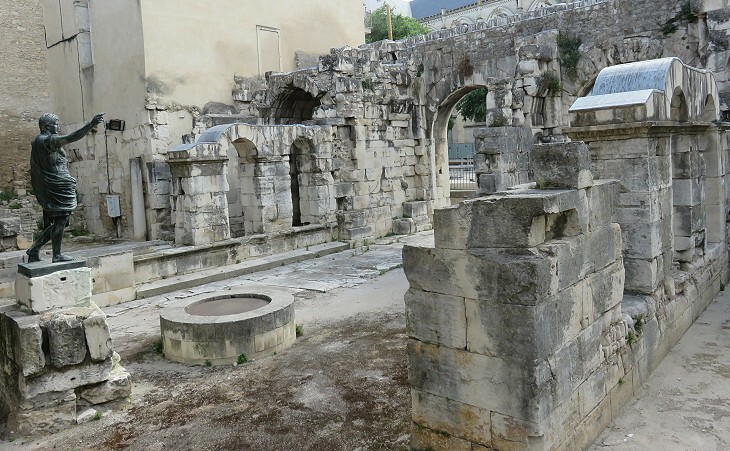 Arelate (Arles), a flourishing trading centre near the mouth of the Rhône, had probably a very large Christian community because a council was held there in 314. 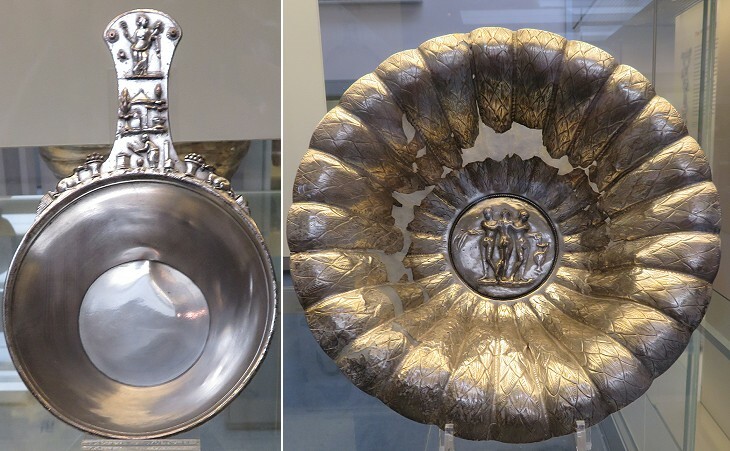 Art historians dated IInd/IIIrd century the silverware of the Chatuzange Hoard, but they were unable to establish precisely when it was buried. The general opinion is that this occurred between 260 and 274, a period of unrest which was due to the establishment in 260 of an independent Imperium Galliarum (Gallic Empire) by Postumus, the governor of the two German provinces of the Empire. Only in 274 Emperor Aurelian was able to restore full Roman authority. The event however showed a line of fracture in the solidity of the Empire which surfaced again in 383 when Magnus Maximus acquired control of Britain, Gaul and Spain and eventually in 392 when Arbogastes, commander of the Roman army in Gaul, challenged the authority of Emperor Theodosius. Listen, O fairest queen of thy world, Rome, welcomed amid the starry skies, listen, thou mother of men and mother of gods, thanks to thy temples we are not far from heaven: thee do we chant, and shall, while destiny allows, for ever chant. None can be safe if forgetful of thee. (..) For nations far apart thou hast made a single fatherland; under thy dominion captivity hath meant profit even for those who knew not justice: and by offering to the vanquished a share in thine own justice, thou hast made a city of what was erstwhile a (wild) world. Namatianus wrote these verses in 415 on his way back from Rome to Gaul, most likely to Toulouse. 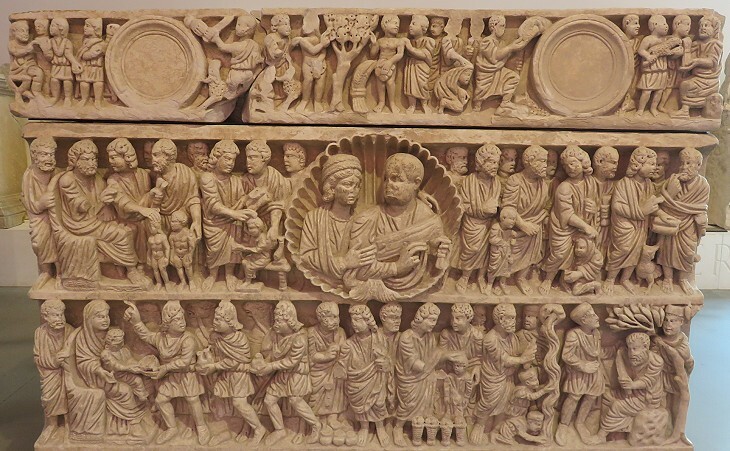 He was aware that he was writing a funerary lamentation because in 407 the Vandals, with the allied Alans and Suebi, had crossed the frozen Rhine and swept across Gaul and into the Iberian peninsula and in 410 the Visigoths had sacked Rome. The weak Emperor Honorius retained only a nominal authority on most of the Western Roman Empire. Eventually Gallia Narbonensis became a Visigothic Kingdom which included most of Spain. In the early VIIIth century the Moors invaded Southern France. Their progress northwards was checked in 732 at the Battle of Poitiers by the Franks who were led by Charles Martel (the Hammer), grandfather of Charlemagne. The region was eventually conquered by Pepin the Short in 760 and parcelled out among his vassals. The depopulation and economic decline of Gallia Narbonensis came to an end towards the year one thousand, similar to what occurred in many parts of Europe. At this point new political and religious entities endeavoured to celebrate the economic and social recovery in new buildings. 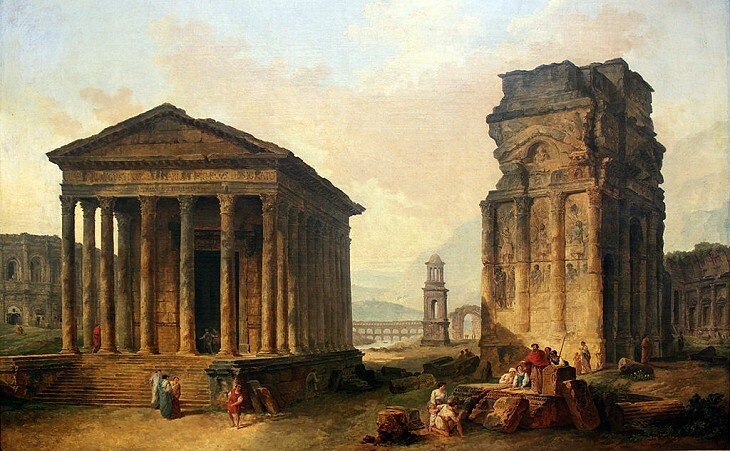 The craftsmen and master masons in charge of them turned for inspiration to the remains of the ancient Roman monuments. 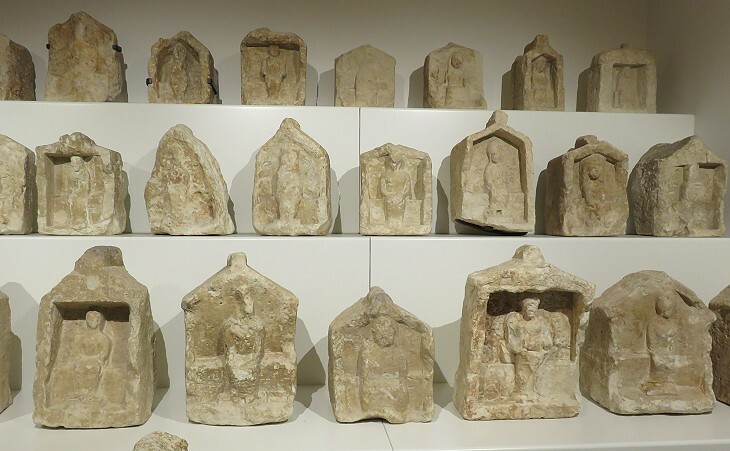 The buildings and sculptures of the region in this period could be easily mistaken for ancient ones and they had a significant influence on the development of Romanesque style in other parts of France and in Northern Spain. 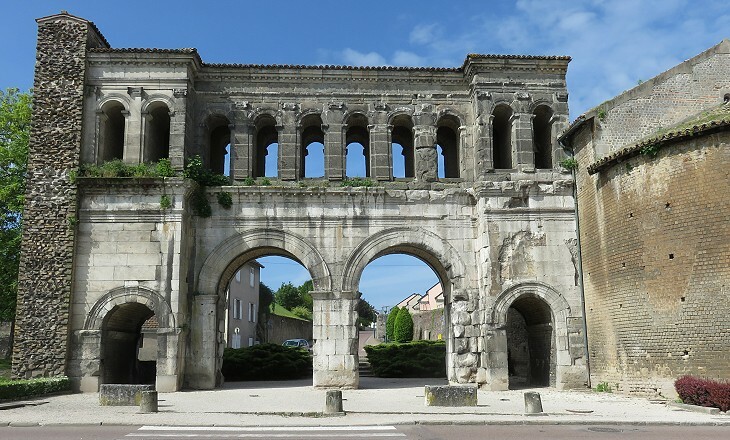 This section covers also some monuments which are not Roman or Romanesque, but which offer an interesting complement to other topics which are discussed in this website, plus a few things I came across in my wanderings in Southern France and decided to share. The image used as background for this page shows the top of a Roman mausoleum at Glanum.